A NEW (2018) DEMO OF A BEARCLAW AND ADIRONDACK OMD MODEL BY SOUND PURE. CHECK OUT THIS VIDEO DEMO OF THE OMD MODEL BY SOUND PURE. The OMS is patterned very closely to the pre-war Martin Orchestra model, considered by many to be the ultimate in versitality. The OMS is a full scale guitar with a comfortable shape and size that is superb for fingerstyle playing. Extraordinarily sweet and well balanced across the tonal spectrum; this guitar is a delight to play. 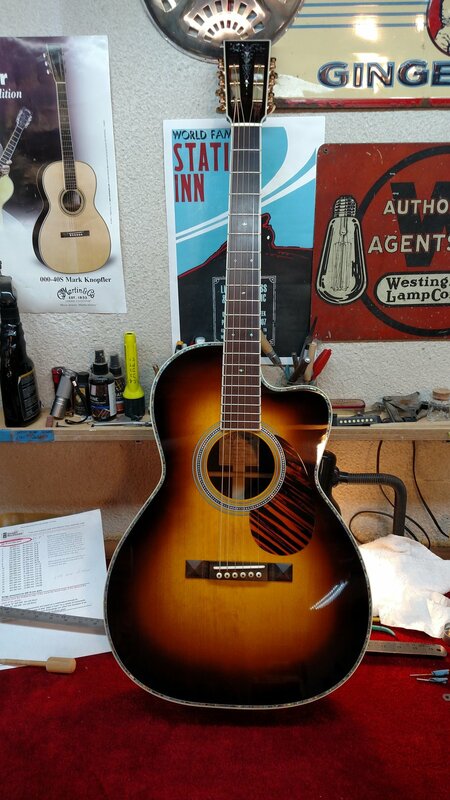 Upper Bout Width - 11.1"
Lower Bout Width - 15.250"
The OMD retains the classic outline of the OMS with an added 5/16" body depth, forward-shifted top braces and a full 4 inch diameter soundhole. The increased body volume offers additional bass presence and slightly louder voice over the standard depth OMS making it a great cross over guitar for both fingerstyle playing and light to medium strumming. 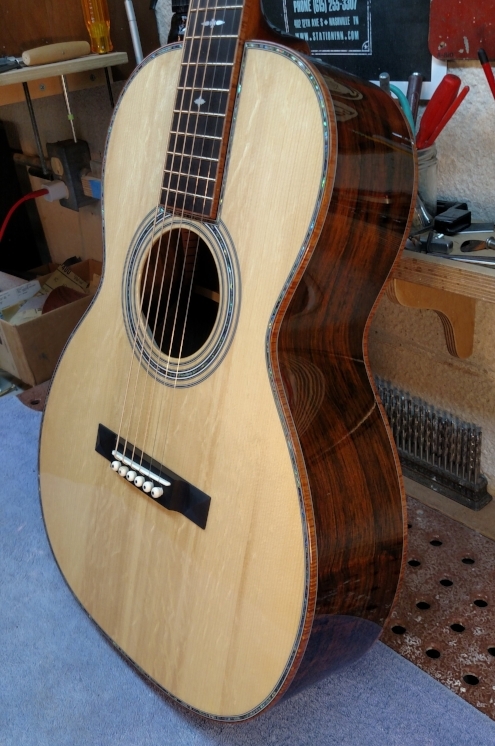 Standard appointments include choice of master grades East Indian Rosewood or Honduras Mahogany back & sides / Adirondack or European Spruce Soundboard / Scalloped Adirondack Spruce braces / Solid Mahogany neck & blocks / Waverly Tuners / 5-ply TKL or Ameritage Case. See pricing & options page for a full list of standard and optional appointments. The Triple O is a shortened-scale version of the OMS. The reduced string tension offers very easy playing with negligible sacrifice in tone and volume as compared to the OMS. A particular favorite of songwriters and fingerstylists, the comfortable shape, sweet rich sound and easy playability will make you fall in love with this guitar. You won’t want to put it down. The unique rich and honey-sweet tone of the 000 12-Fret is a result of the elongated lower bout with the bridge placement smack in the center of the "sweet spot" The 12-Fret model of the 000 is a full-scale length instrument and packs plenty of power while exhibiting amazing sensitivity for light strumming or fingerstyle playing. 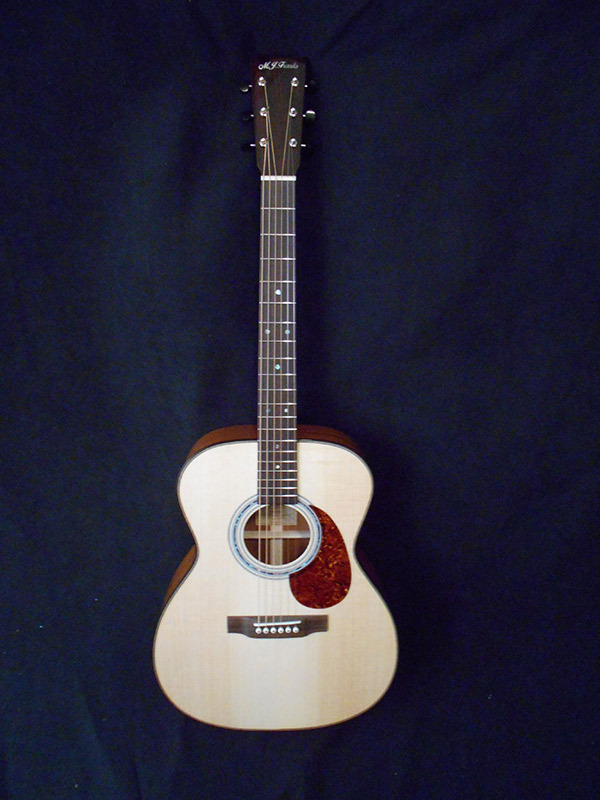 Many players consider the 000 12-Fret to be the ultimate fingerstyle guitar. Comfortable to play and sweet to the ears. Available with cutaway and classic slotted headstock. Upper Bout Width - 10.750"
Lower Bout Width - 15.0"
The 00 12-Fret is a slightly scaled-down version of the 000 12-Fret. The scale length is shorter (24.9") resulting in reduced string tension and ease of playability with little sacrifice in voice or volume. An excellent instrument for fingerstyle or strumming. Available in a deep (4 5/8") body depth. Upper Bout Width - 10.875"
Lower Bout Width - 13.312"
Deep Body Depth - 4.500"
Standard appointments include choice of master grades East Indian Rosewood or Honduras Mahogany back & sides / Adirondack or European Spruce Soundboard / Scalloped Adirondack Spruce braces / Solid Mahogany neck & blocks / Vintage styles pyramid bridge / Waverly Tuners / 5-ply TKL or Ameritage Case.